The Pathfinder MKVIE has been designed to detect faults on networks that are earthed through an Arc Suppression coil, or sometimes known as a Petersen coil. When a fault occurs on any feeder from a substation, the ASC will automatically trigger, having the effect of tuning the reactive and capacitive currents with a subsequent rise in phase voltage, but limiting the fault current to very small levels, and thus being able to maintain service on the feeder. Finding the fault on such systems can be extremely difficult. The Pathfinder MKVIE looks at the 3rd Harmonic component of the fault comparing the vertical and horizontal electro-magnetic fields. The field changes in nature beyond the fault which can be detected by the instrument. 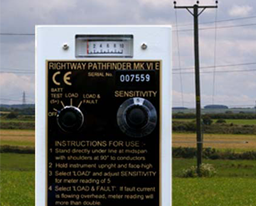 The Pathfinder MKVIE can be used in hand to patrol the overhead line, and the point of change in field will determine the fault location.